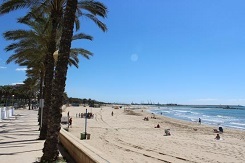 You can discover the trendy Paddle surf in Vilanova, by participating in an excursion (35 euros per person) or rent one if you want to explore the area by yourself (10 euros per paddle for an hour, 15 euros for 2 hours). For the windsurf, if you feel confident enough, you can rent it by hour (15 euros) or, you can participate to classes. The offer here is two hours per day during four days. You will enjoy the sensation and being advice by a professional. This is 220 euros per person. The Nautical station offers different possibilities. 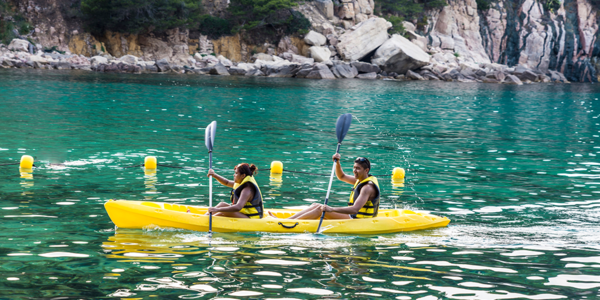 You can rent a kayak, one, two or three, by the hour for 15 euros. However, you can go on a excursion, a better way to discover the beautiful Garraf Coast. Once again, according to your level, different excursions are available, from 2 hours to 4 hours, with even snack included in one of them. Discover the best one for you, from 29 euros. Discover the joy of sailing! One of our favorite excursion is the one happening at night. Indeed, you can admire the clear sky of Vilanova i la Geltrú during the two hours sailing. On the other side, you can also wake up early and go fishing, to learn more about the fishes and bring back fresh food for lunch! But be ready to wake up early, the boat leaves at 6 am. You can find all the information you need on the Nautical station’s website and book with them your favorite activities. Enjoy your stay in our familial hotel in Vilanova.